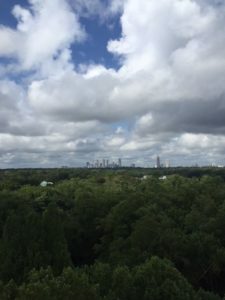 For nearly five years the Center for Sustainable Communities in Atlanta has worked extensively with many stakeholders including government agencies, universities, and colleges, local agencies, professional associations, national laboratories to launch the Advanced Atmospheric Research and Monitoring Station (AARMS) project. 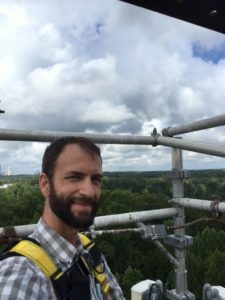 The approach of the AARMS project is to design, integrate and install advanced instrumentation and equipment on a 140-ft tall tower located in the Fernbank Forest to collect long-term meteorological and atmospheric data. The AARMS project aims to support academic atmospheric and meteorological research by adopting rigorous standard operating procedures for instrument deployment, maintenance, and data collection. The project consists of five components; ( 1) a research station; (2) earth science laboratory, (3) stem education, (4) urban outreach and (5) community engagement. 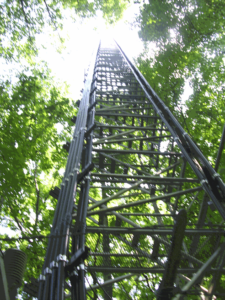 The unique location of the tower in an urban old-growth forest in the Southeast U.S. and the capability to install instrumentation at different heights above and below the tree canopy make the AARMS project applicable to a variety of research topics, such as atmospheric chemistry, weather and climate change, air quality, and environmental epidemiology etc. 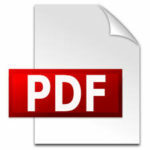 SC -ATL has developed numerous stakeholders to help make the project a reality. For example, recently, CSC-ATL, as part of its Earth Science Laboratory and Climate Research initiative partnered with the University of Georgia, Fulton County Schools, and Fernbank Museum of Natural History to help lead an effort to conduct on a tree survey project to calculate the carbon sequestration impact of the adjacent, a 65-acre undisturbed, old-growth hardwood urban forest centrally located in metropolitan Atlanta. Please consider donating. Here is a letter from Gary to Donors.